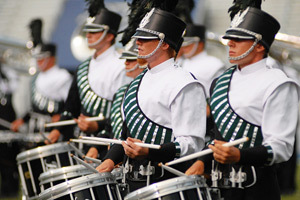 Within the two consecutive days of competition at the Pearl Presents The Masters of the Summer Music Games event at Middle Tennessee State University in Murfreesboro, Tenn., all 22 of Drum Corps International's World Class corps had made an appearance in the stadium. Along with events in Hattiesburg, Miss. and Gadsden, Ala., the Murfreesboro shows were part of the 2009 DCI Southern Series. The series culminated with the DCI Atlanta Southeastern Championship presented by Lake Oconee & Greene County, GA event at the Atlanta Georgia Dome on Saturday, July 25. The Tennessee edition of the series featured performances by established World Class corps, as well as DCI's new kid on the Open Class block, Music City, from Nashville, Tenn. The corps presented the national anthem during Thursday night's show and competed in the Open Class competition both nights. Earning top honors in the first night of competition was the Cavaliers, who continue to close the competitive gap between themselves and Murfreesboro day two winners, the Blue Devils. Other World Class front runners traded places throughout the weekend like Santa Clara Vanguard who took second place in the first night's competition over Carolina Crown. Corps continue to add and make changes to their programs, all while perfecting their music and visual performances. Phantom Regiment, for example made almost five minutes (nearly half) worth of changes to their program, "The Red Violin," in the days just before the Southern Series began. View photos from this event. Photos by Johnny Gilbert, Craig Olear.